I’m in the process of finishing an e-book titled, “You are Called,” about the supernatural ministry of love, power, grace and truth that Jesus started while He walked on the earth, and that same ministry He continues through His people today. The book is a revision, and the original was completed while we lived in Guatemala. Working on it has reminded me how much God wants to use all of us in His kingdom… It reminds me that God uses ordinary people to do extraordinary things. When I left off on the blog, Red Ball Jets and Gideon (The Man Who WentAgainst the Crowd), Gideon had just been given an assignment by the Lord to destroy an idol in his father’s town. 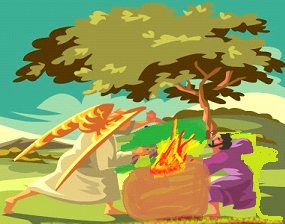 He was to then build an altar, and sacrifice his father’s second bull to the Lord as a burnt offering. So he obeys the mission. He does it, but he does it afraid. He tears it down at night, and sacrifices to the Lord and he takes ten other men along to help him. Gideon was willing and obedient, and shortly after that, the bible says that the Spirit of the Lord came upon him to blow a trumpet to rally the troops! Even as he was gathering an army of 30,000 men, Gideon still dealt with unbelief. He decides that in order to know for sure that God was true to His word, Gideon asks the Lord for two signs, a dew-filled fleece and a dry fleece. Early on in my walk with the Lord, I heard lots of people talk about putting a “fleece” out before the Lord. In other words, “God, I’m not sure if I can trust You at Your word – You need to show me a sign.” And what is amazing to me, is God does it! Then the Lord tells Gideon he has too many people in the army, and tells him to tell whoever is “fearful and afraid” to go home. [Except you Gideon!] Twenty-two thousand people returned. There was a whole lot of scared folks in that army! The Lord tells him again that there are too many, and to take them down to get water to be tested. Oddly, he tells him that everyone who laps water from their hand, instead of kneeling down, is to stay. Then there are only 300 left. The original 300! So out of an army of 30,000 people, the overwhelming majority (29,700) have gone home. Then God tells Gideon to go down into the Midianite camp because He has delivered them into his hand. God says, “But if you are afraid, take Purah your servant.” Guess what? He took him! God bless Brother Gideon – he had to overcome so much fear and unbelief – but he was obedient (even if he was afraid)! Gideon then goes on to win a battle using no weapons, just psychological warfare with a trumpet, a torch, and a jar in each soldier’s hand! His strategy is still taught in war colleges today. God got the glory for that victory because one man, Gideon, obeyed God, even through fear and unbelief. God did not get impatient or angry at Gideon’s unbelief, in fact a couple of times, He ignored his words, and commissioned him anyway. Even though Gideon was afraid, he obeyed the Lord, and because of his obedience, God delivered Israel. How often have you been afraid to do something you feel the Lord is putting on your heart? How often does the Lord overlook your fear and commission you anyway?